Glass weaving was a well-established art form in Europe but was rarely used in the United States. J.A. Decknatel and Son established this unusual show of weaving glass as if it was made out of fabric. 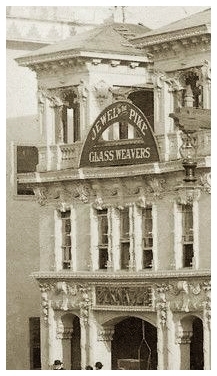 Weaving the fiery glass into thread, they produced an array gowns, neckties, napkins, large tablecloths- all out of glass. On occasion, their products were even combined with silk. Each patron was given a small colored glass bow as a souvenir. Decknatel's company also produced a diverse collection of traditional glass items such as plates, vases, bowls, and glasses. of the Pike' in the arc. Glass weaving on the Pike.